New Core writers, clockwise, from top-left, Darren Canady, Ariel Stess, Marisela Treviño Orta, Erin Courtney, Ray Yamanouchi and Stacey Rose. MINNEAPOLIS (May 23, 2018) — The Core Writer program at the Playwrights’ Center gives 25-30 of the most exciting playwrights from across the country the time and tools to develop new work for the stage. The Center is announcing new Core Writers Darren Canady, Erin Courtney, Marisela Treviño Orta, Stacey Rose, Ariel Stess and Ray Yamanouchi. In addition, the Playwrights’ Center is pleased to welcome three new student playwrights to its Core Apprentice program for 2018-19: Lily Padilla, Drew Paryzer and Lauren Wimmer. The Core Writer Program at the Playwrights’ Center provides play development workshops and professional support over a three-year term. Work by Core Writers composes the Center’s public season (the PlayLabs new play festival in October and the Ruth Easton New Play Series December through April). 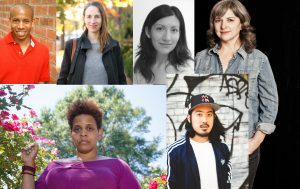 Playwrights who have benefited from the Core Writer program include Christina Anderson, Trista Baldwin, Lee Blessing, George Brant, Carlyle Brown, Connie Congdon, Marcus Gardley, Jeffrey Hatcher, Sherry Kramer, Carson Kreitzer, Martyna Majok, Melanie Marnich, Winter Miller, Greg Moss, Qui Nguyen, Kira Obolensky and Alice Tuan. New Core Writer apprentices, from left, Drew Paryzer, Lauren Wimmer and Lily Padilla. The Core Apprentice program at the Playwrights’ Center pairs student playwrights or recent graduates with professional mentors and offers full play development workshops at the Center. Past recipients include George Brant, Ike Holter, Hansol Jung, Kimber Lee, Andrew Saito, Jen Silverman, Lauren Yee and Martín Zimmerman. The 2018-19 Core Apprentices are Lily Padilla (University of California San Diego), Drew Paryzer (The University of Texas at Austin) and Lauren Wimmer (Carnegie Mellon University). Core Writers and Core Apprentices are selected by diverse national panels of artists and theater leaders.